2017 is drawing to a close and 2018 is rapidly approaching. It always seems like such a big transition, moving from one year to the next, but when you think about it, December 31st, 2017 and January 1st, 2018 aren’t going to be that much different. Let’s face it, 11:59pm on the 31st of December is really not much different to 12:01am on January the 1st. Rationally, the transition into 2018 holds no more meaning than the transition from November 30 to December 1, or as 3:36am quietly clicks over to 3:37am. Why does the passage of time matter so much more at the stroke of midnight? 11:57pm is probably feeling a bit irked. Change in all other parts if our lives is a bit like the movement of the clock. Every now and then, we look to see that change has happened but it’s been happening imperceptibly all around us, the state of perpetual flux. There are always constants – the immutable sunrise and sunset, the lunar rhythm of the full moon, the soft cycle of the seasons. It’s easy to be distracted by their comforting predictability. 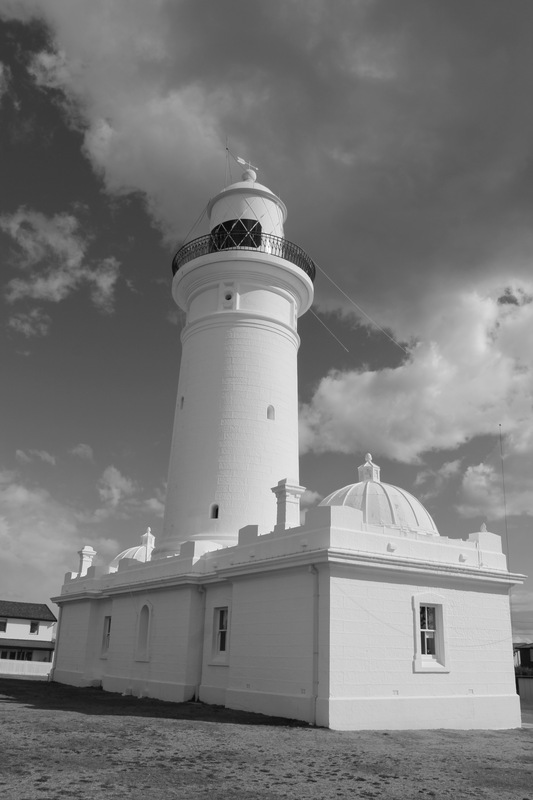 And yet, ironically, it is these power of these cycles that creates the constant change all around us that we fail to perceive – the winds, the rain, the tides which ever change our natural world, sculpting our land and changing our oceans over eons. Change is constant, whether it be in our natural world, in our community, or in our body. How we approach this change is a key to living a life of joy and meaning. It’s natural to dislike change. Our brains are essentially predictive pattern recognition engines. Our brain understands our environment by using the pattern of the world it’s already learnt to make a prediction of what it thinks will happen, and then it compares that prediction to the current inflow of information. If the brain’s prediction and the inflow of information match, the brain doesn’t need to do any more work. When the brain encounters something it didn’t predict, it has to work a lot harder to process the new information and use that information to update its internal model of the world. I don’t like to shave, because shaving takes time, energy and resources. By not shaving, I’m being much more efficient (though some would say ‘lazy’). Our brains are like my shaving habits. The brain would much rather not have to process any extra information because that takes time, energy and resources. By not having to process any more new information, our brains are efficient. Unlike my shaving habits, which probably are born of laziness, the brain likes to conserve energy since there’s only so much fuel the body can spare for it, and the more efficient the brains processing is, the less fuel it needs. So by keeping things fairly constant and avoiding change, the brain can just plod along rather efficiently without all the extra resources needed if it had to process constant change. But this puts us in a bit of a bind, since change is happening anyway whether our brains want it to or not. It becomes the immovable force versus the irresistible object. We can dig in and resist the inevitable, or we can adapt to the change. If we dig in, if we stay static, if we fail to adapt, then it eventually costs us more in terms of energy. It creates a greater cognitive load – maybe not in the short term, but resisting change is like padding against the current … it takes a lot of work, and it’s cognitively taxing. All that energy for no actual gain, well, we’ve talked about that before in other posts. We can’t change ‘change’, and by trying to change ‘change’, we expend huge amounts of energy to get nowhere. And it changes nothing, except for diminished motivation, volition and resistance. The futile fighting with ‘change’ makes it hard for joy to flourish, not that it stops us trying sometimes. John C. Maxwell wrote, “Change is inevitable, growth is optional”. You can certainly keep swimming upstream if you want to, or you can accept that change can not be changed and adapt in productive ways You can channel the energy that would have otherwise gone into resisting change and put it into something that aligns with your values and helps to enhance your life of meaning, in turn helping you to grow your joy, not unwittingly sabotage it. 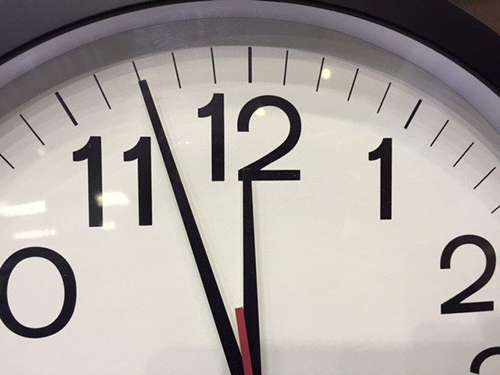 If you don’t want to get stuck at 11:57pm and you want to move forward into the new year, accept the inevitability of change, and take that first step of committed action in the direction of your values. Perhaps it was the hypnogogic delirium, but I had an epiphany. Truthfully, it was probably less epiphany and more of a reminder, that little “oh yeah” sort of moment. Yesterday I was sitting in an airport lounge at 5am, waiting to be whisked away on my 6am flight to the tropical north to join my family and in-laws for Christmas. For the life of me, I can’t remember why I decided to book a flight for six in the morning. I think the flight was cheap, and I thought to myself “6am … that’s not that early …”. I forgot that to allow for travel time and checking in, I had to get up at 3:30am. Not even sparrows are awake at half-past three. In fact, I’m often going to bed at that time of night, so this whole pre-dawn awakening thing was really foreign. The fact that I was showered, dressed, and sitting at the airport compos mentis was really weird … I think I was slightly delirious. Still, the whole predawn awakening thing was enlightening. It was a refreshing glimpse of a time of day that I normally spend hibernating. The first thing I noticed was the light. I always thought that dawn and dusk were the same but just lighting from the opposite direction, but there’s a subtle difference in the hue that gives the early morning a softer, fresher glow. The other thing I noticed was the stillness. Everyone else in their right mind didn’t book dawn flights and were still snug in their beds, so the usual hustle and busy buzzing that usually fills the streets was absent. 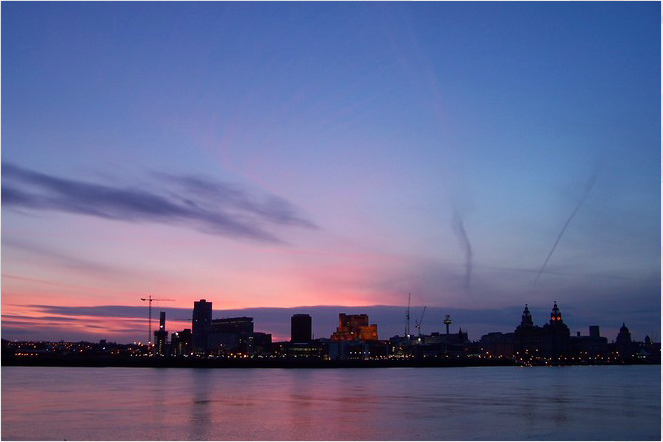 The soft cool breeze on my face, in the midst of the calmed half-light was almost meditative. It was quite a change to my daily routine of sleeping until I have to drag myself (and the kids) out to our usual daytime occupations. The stillness and beauty of my new perspective of dawn reminded me of how it’s easy to get stuck in the same pattern. Our routines are partly a function of necessity – we have to go to work, the kids have to go to school, we have to get groceries, attend social functions, go to church on Sundays. There isn’t anything necessarily wrong with this repetitive normality. Still, our brain gets used to the usual patterns and it starts to filter out the same input that it gets continually exposed to, and our brains function on autopilot. This process of automation, habituation and suppression is an advantage for our brains in terms of efficiency and energy conservation, but this leaves a bit of a cognitive void which our brain fills with the internal monologue of our own confabulation. We drink our own kool-aid, as it were. This is what people often think of as “the rut”, that existential inertia and stagnation, the first-world malaise of meaningless repetition. The antidote to the rut is to break the pattern. When we have a change to our circumstances and we experience something new, our brain has to process things differently. More processing power is needed, which involves our working memory and our conscious stream of thought. One small step outside the comfort zone of our routine, and all of a sudden, the world can seem fresh and new again. This process is enhanced through mindfulness. When we practice mindfulness, we fully engage in the present moment. We can appreciate the detail that we so often filter out and ignore. We can (and should) practice mindfulness at any time, but when we’re engaging in a new experience, immersing ourselves in it mindfully will only enhance it. The perspective of dawn that I experienced yesterday helped remind me of the power of stillness in an ever-demanding world over-saturated with stimulation. I hope that this Christmas and New Year, you can take the time to have your own ‘perspective of dawn’ as it were – step out of your comfort zone and experience something completely new, and engage with the experience fully, mindfully. I hope you gain a fresh insight that you can help propel you forward into the amazing potential that 2017 holds for us all. From my family to yours, have a very Merry Christmas and a safe and prosperous New Year. Stress and sugar. In our post-modern society’s orthorexic narrative, these are two of the biggest villains. So combining them into a diabolical duo reinforces their evil even more. Dr Caroline Leaf is a communication pathologist, self-titled cognitive neuroscientist and Christian life coach. 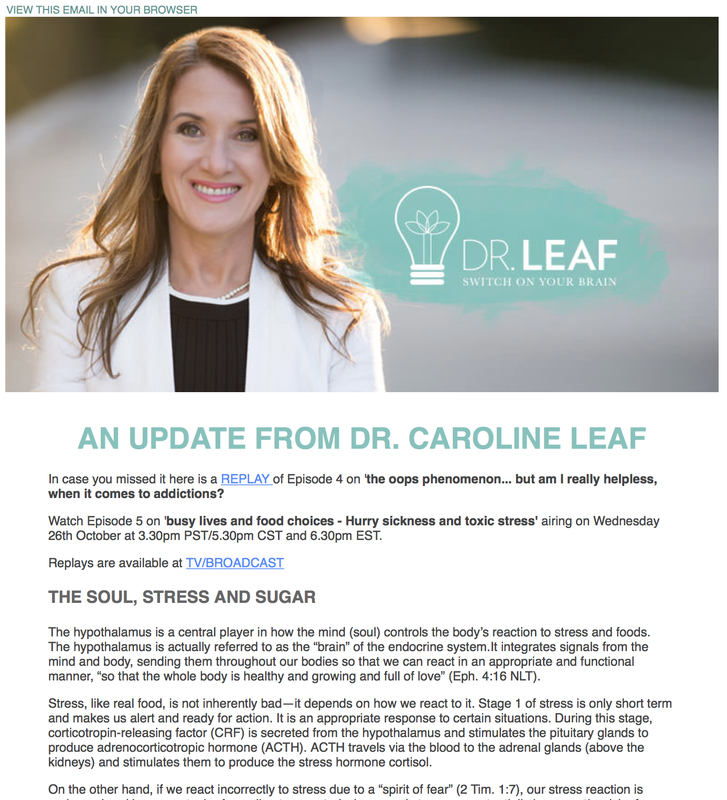 In her latest newsletter to her adoring fans, Dr Leaf has accused sugar and stress of mass murder, with our soul’s approach to stress as their accomplice. I’m sure Dr Leaf means well, but just because she’s not trying to frighten sales out of the gullible and vulnerable doesn’t mean she gets a free pass on the accuracy of her information. The arguments seem plausible on the surface. Most people have heard enough about stress to know about ‘good’ stress and ‘bad’ stress. It doesn’t seem too much of a stretch to say that ‘bad’ stress is a significant cause of disease and death. In the middle of her essay, Dr Leaf jumps from stress to sugar with no preceding link, but again, most people have heard that sugar is unhealthy, so they would probably just accept that statement too. Unfortunately for Dr Leaf, her article has several critical errors which turn her well-meaning educational essay into a science-fiction short story. To start with, her essay is built on the dysfunctional premise that the mind controls the brain, so each higher argument or premise is fundamentally skewed from the outset, and in doing so, Dr Leaf simply creates a circular argument of distorted factoids. For example, her opening sentence: “The hypothalamus is a central player in how the mind (soul) controls the body’s reaction to stress and foods.” The hypothalamus is a part of the limbic system deep in the brain. It’s the main pathway from the brain to the endocrine system as Dr Leaf goes on to correctly assert, but essentially it runs on auto-pilot, responding automatically to information already being processed at a level beyond the reach of our conscious awareness and control. For example, the hypothalamus regulates our body temperature, but it does so without our conscious control. We can not consciously will our body temperature up or down just with our minds. It’s the same with the stress response – there are many times where people have a subconscious stress response, where their mind feels like there’s nothing to be afraid of, but their hypothalamus is still priming their system for fight or flight. White coat hypertension is a prime example. White coat hypertension, or “White Coat Syndrome” is the phenomenon of people having high blood pressure in their doctor’s office but not at home. Patients will say to me all the time, “I don’t know why my blood pressure is so high in here. I feel fine. I know there’s nothing to be afraid of here.” But while their conscious mind is relaxed, their deeper subconscious brain remembers those injections that hurt, or that one time a doctor stuck the tongue depressor too far down their throat and they felt like they choked on it, and their hypothalamus is preparing them for whatever nastiness the doctor has for them this time. Dr Leaf’s statement fails because she wrongly equates our brain with our mind, a subtle perversion which doesn’t just invalidate her premise, but significantly skews the essay as a whole. As a quick aside, Dr Leaf also says that the hypothalamus “integrates signals from the mind and body, sending them throughout our bodies so that we can react in an appropriate and functional manner, ‘so that the whole body is healthy and growing and full of love’ (Eph. 4:16 NLT)”. Ephesians 4:16 isn’t talking about the physical body, but about the body of Christ. You don’t need to be a Biblical scholar to know this, you just have to be able to read. Here is what the Bible says, “And He Himself gave some to be apostles, some prophets, some evangelists, and some pastors and teachers, for the equipping of the saints for the work of ministry, for the edifying of the body of Christ, till we all come to the unity of the faith and of the knowledge of the Son of God, to a perfect man, to the measure of the stature of the fullness of Christ; that we should no longer be children, tossed to and fro and carried about with every wind of doctrine, by the trickery of men, in the cunning craftiness of deceitful plotting, but, speaking the truth in love, may grow up in all things into Him who is the head — Christ — from whom the whole body, joined and knit together by what every joint supplies, according to the effective working by which every part does its share, causes growth of the body for the edifying of itself in love.” (Ephesians 4:11-16, emphasis added). There’s no subtlety about this misuse of scripture. Even non-Christians would be able to figure out that this verse has nothing to do with the physical body. Dr Leaf has demonstrated that she either doesn’t read the Bible or doesn’t understand it. Either way, this is a shameful indictment on Dr Leaf’s claim that she’s a “Biblical expert”, and should be ringing alarm bells for every pastor that is considering letting her get behind the pulpit of their church. Dr Leaf rolls on with her list of medical misinformation. Some of it is subtle (the “stages of stress”, also termed the General Adaptation Model, is an outdated model of the stress response , and CRF and ACTH are released during all stages of stress, not just stage 1). Some of it is outlandish, like her claim that high levels of stress leads to Cushing’s Syndrome (see http://emedicine.medscape.com/article/2233083-overview#a4 for a list of the causes of Cushing’s Syndrome and note that stress isn’t on the list). Dr Leaf’s also suggested that it was solely our perception of stress that was the key factor in the outcome of stress, making reference to “a study” showing a 43% increase in mortality if you thought stress was bad. This is an example of cherry-picking at it’s finest, where one study’s findings are misrepresented to try and support one’s pre-existing position. Dr Leaf didn’t bother to list her references at the end of the article, instead expecting people to find it for themselves, but I’ve previously seen the study she’s referring to. Keller and colleagues published the study in 2012 . Their survey suggested a correlation between overall mortality and the combination of lots of stress and the belief that stress is bad. But remember, correlation does not equal causation, a golden rule which Dr Leaf is quick to ignore when the correlation suits her argument. The Keller study, while interesting, did not control for the impact of neuroticism, the “negative” personality type which is largely genetically determined and is independently associated with a higher mortality [3-9]. It does not prove that thinking about your stress in a better way makes you live longer. Dr Leaf can’t even get her vexatious arguments right. Not that the number really matters, because notice how the authors described the magic number as an “assumption of causality”. Basically the authors said, ‘Well, IF this was the cause of death, then these would be the numbers of deaths attributable.’ They NEVER said that anyone actually died because of their beliefs about stress. Indeed, the results showed that just believing that stress was bad didn’t make any difference to the mortality rate as Dr Leaf suggested – it was the interaction of high stress AND the belief it was bad that was associated with a higher mortality. But why let pesky issues like methodological rigour get in the way of sensationalist hyperbole. Then in the penultimate paragraph, Dr Leaf suddenly decides to throw sugar into the mix. Somehow without justification, stress is bad and therefore sugar is also bad, and they both throw the hypothalamus and the rest of the body into toxicity. Dr Caroline Leaf is promoted, by herself and by many in the Christian church, as a Biblical and scientific expert, but in one short promotional essay, Dr Leaf makes multiple critical scientific and exegetical errors. In other words, her errors in discussing scientific findings and basic Biblical text are so massive that they are incongruent with her claim to be an expert. 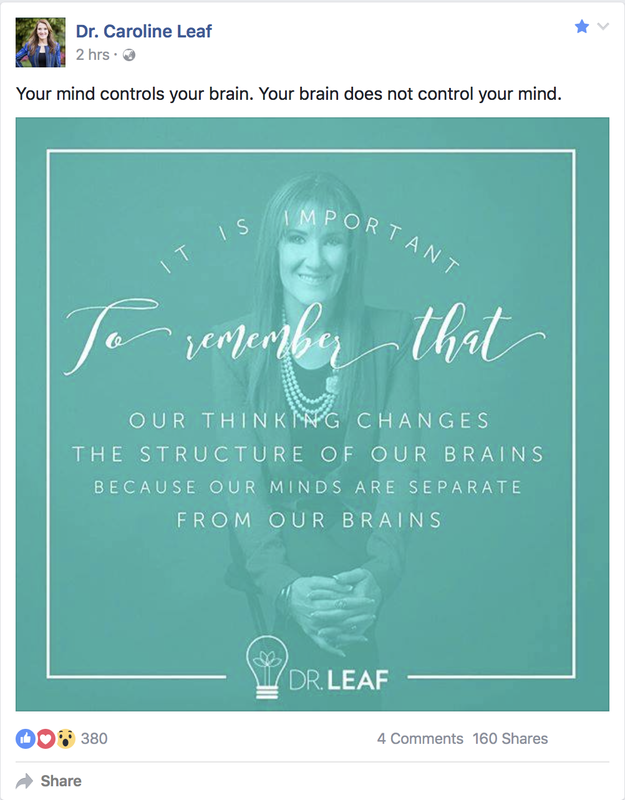 Something needs to change – either Dr Leaf revises her knowledge and improves her accuracy, or she needs to stop misleading people from pulpits, both virtual and real. McEwen BS. Stressed or stressed out: what is the difference? Journal of psychiatry & neuroscience : JPN 2005 Sep;30(5):315-8. Okbay A, Baselmans BM, De Neve JE, et al. Genetic variants associated with subjective well-being, depressive symptoms, and neuroticism identified through genome-wide analyses. Nature genetics 2016 Apr 18. Servaas MN, Riese H, Renken RJ, et al. The effect of criticism on functional brain connectivity and associations with neuroticism. PloS one 2013;8(7):e69606. Hansell NK, Wright MJ, Medland SE, et al. Genetic co-morbidity between neuroticism, anxiety/depression and somatic distress in a population sample of adolescent and young adult twins. Psychological medicine 2012 Jun;42(6):1249-60. Koelsch S, Enge J, Jentschke S. Cardiac signatures of personality. PloS one 2012;7(2):e31441. Gonda X, Fountoulakis KN, Juhasz G, et al. Association of the s allele of the 5-HTTLPR with neuroticism-related traits and temperaments in a psychiatrically healthy population. Eur Arch Psychiatry Clin Neurosci 2009 Mar;259(2):106-13. Lahey BB. Public health significance of neuroticism. Am Psychol 2009 May-Jun;64(4):241-56. On Facebook today, Dr Leaf published a menagerie of memes, a full house of five of her favourite little nuggets of wisdom that comprise the pillars of her teaching. For example, “Everything you first do and say is first a thought.” And, “You alone are responsible and can be held responsible for how you react to what happens in your life: your future is open, filled with an eternity of possible situations and choices.” Too bad that our genes, which are not the result of our choices, are the biggest influence of our personality and our capacity to cope with our external environment (Vinkhuyzen et al, 2012), and that we often do and sometimes say things without thinking (https://cedwardpitt.com/2014/11/08/dr-caroline-leaf-putting-thought-in-the-right-place/). With the weight of scientific evidence bearing down on her, Dr Leaf has finally given a little and made a concession. 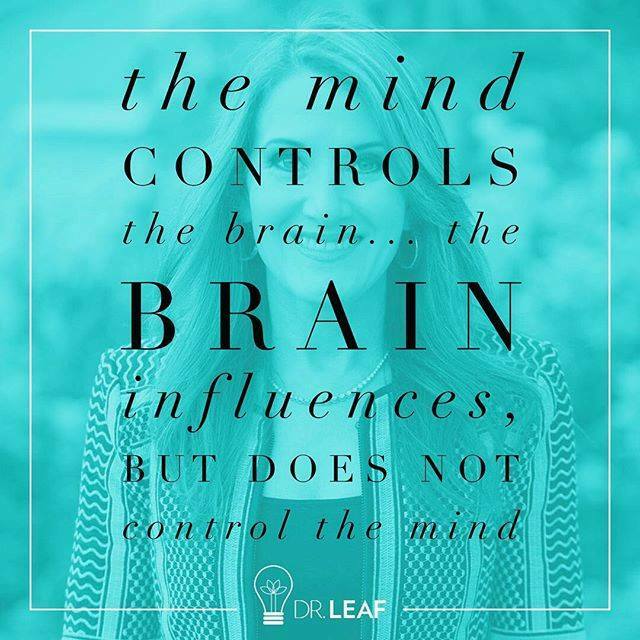 Now the brain influences, but is still controlled by, the mind. While it’s a step in the right direction, Dr Leaf’s meme is still wrong. It doesn’t matter what small changes Dr Leaf makes to the window dressing of her teaching, her ministry is so structurally unsound that it’s derelict. The relationship of the brain to the mind is a little like the relationship of our cars dashboard to the engine. We don’t see all of the actions of the engine under the hood of our car, but it powers our car nonetheless. What we do see is the dashboard. We can see our speed, and depending on the make and model of the car you drive, the dashboard also shows the engine temperature, revs, fuel and the warning lights for our engine and our electrics. In the same way, our brain powers us. It’s the engine purring along under the surface. Our mind is the dashboard, giving us a tiny glimpse at a much greater process underneath the surface. Suggesting that our mind is in control of our brain is like suggesting that our dashboard is in control of our engine. The mind is a product of our brain designed to give us conscious awareness of a small portion of a much deeper stream of activity that senses our environment, alters our moods, plans our actions and then executes them. By basing her entire ministry on such science fiction, Dr Leaf makes a mockery out of every church that hosts her, of everyone that buys her books, and of everyone who subscribes to her programs. She also makes a mockery of herself, which is the saddest part of this whole story. I hope that she stops making changes to the window dressings of her ministry, and starts to make the necessary changes to her foundations before it’s too late and the whole thing comes crashing down. Can you really Think and Eat Yourself Smart? 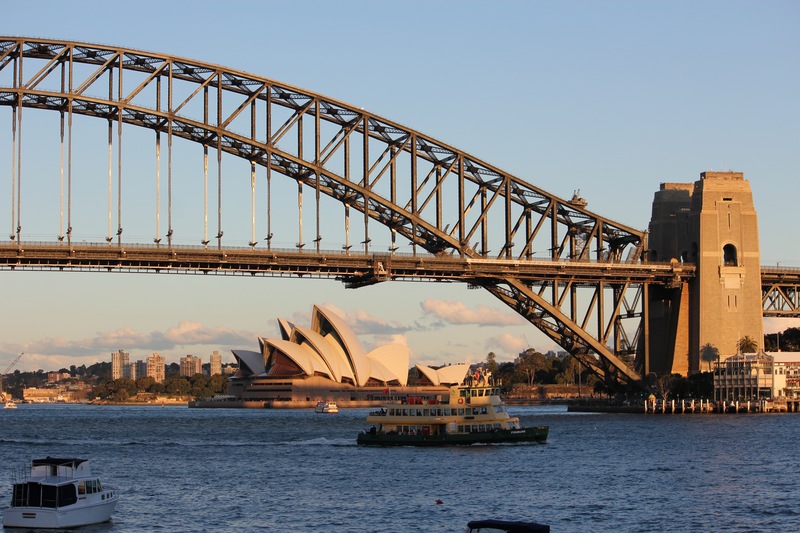 Today I’m in Sydney, a vibrant, bustling city which centres on one of the most beautiful harbours in the world. When I booked my flights in April, I was originally going to spend the day attending Dr Caroline Leaf’s Australian Think and Eat Yourself Smart workshop. Dr Leaf and her minions revoked my ticket a few weeks later. She also changed the workshop twitter hashtag from #thinkandeatsmart to just #eatsmart, so perhaps Dr Leaf doesn’t want free thinking at the workshop. It’s such a shame really, because I was looking forward to being part of the history of Dr Leaf’s first workshop on Australian soil. But no matter … why waste a perfectly good plane ticket when I can have a day to sightsee, take photos, and catch a few Pokemon here and there as well. As the name would suggest, the Think and Eat Yourself Smart workshop is based on Dr Leaf’s book, Think and Eat Yourself Smart. Does the book (and the subsequent workshop) deliver what it promises? That is, can you really think and eat yourself smart? It’s all well and good for Dr Leaf to espouse her fringe opinions on the food industry and modern farming, and to recycle nutritional information that doctors and dieticians have been promoting for years, but if her book can’t deliver on its titular promise, then it’s just an unoriginal rehash. To support her thesis that we can think and eat ourselves smart, Dr Leaf declares that what you think affects what you eat, and what you eat affects what you think. It’s on these intertwined ideas that Dr Leaf’s book stands or falls. Let’s look at those statements in more detail. Dr Leaf has a broad approach with this premise. She suggests that the mindset that you have will not only determine what you consume, but also how your body will process it. We can break down these statements to assess their validity. This means that Dr Leaf’s statement, and indeed, her entire book, is built on gross misrepresentations of illegitimate resources. Genetics and our external environment actually play a much greater role than she is willing to give credit for. The mindset behind the meal is largely irrelevant – nowhere near 80 percent as Dr Leaf suggests. But for the sake of argument, let’s take a couple of well-known medical conditions that are often associated with lifestyle and compare the research examining the difference that thinking and food make to them. After all, if your mindset really is responsible for more than 80 percent of our health, then these two very common conditions should improve by more than 80 percent when thought patterns are changed. Hypertension is also known as high blood pressure. First, a brief explanation of what the numbers mean when talking about blood pressure so we’re on the same page: Blood pressure is measured in units of millimetres of mercury (or mmHg). The old sphygmomanometers were hand pumps attached to a rubber bladder and a column of liquid metal mercury. The blood pressure reading was however high the column of mercury rose at the two ends of the cardiac cycle. There are always two numbers, expressed as ‘number 1 over number 2’ and written as N1/N2, like 120/80 or ‘one hundred and twenty over eighty’. The top number is the maximum pressure in the arterial system when the heart pumps the blood into the arteries. The bottom number is the pressure left over in the arterial system just before the heart beats again. A blood pressure of 120/80 is the gold-standard physiological reference of normal blood pressure. A blood pressure consistently above 140/90 is considered high. Primary hypertension, which accounts for about 95 percent of all cases, has a strong genetic component. According to eMedicine, “Epidemiological studies using twin data and data from Framingham Heart Study families reveal that BP has a substantial heritable component, ranging from 33-57%.” (http://emedicine.medscape.com/article/241381-overview#a4) Environmental causes account for nearly all of the rest. Secondary hypertension is related to a number of different diseases of the arteries, kidneys, hormone system and many others. Diet is clearly part of those environmental causes. Psychological stress is in there too, but the question is, how important is it? If Dr Leaf is right, it should be 80 percent. According to medical research, reducing alcohol intake to one standard drink per day or less reduces the systolic blood pressure (the top number) by between 2 and 4 mmHg. Reducing salt to less than 6g a day decreases the systolic blood pressure by between 2 and 8 mmHg. At best, that’s a 12mmHg reduction. The DASH diet is as close to Dr Leaf’s macrobiotic tree-hugging anti-MAD diet as one could reasonably get, relying not just on cutting out salt, but also consuming low fat milk and lots of fruit and vegetables. At best, the DASH diet could shave another 6mmHg from the standard low salt diet. So that’s a grand total of 18mmHg with even the most optimistic of expectations. Compared to diet, the best improvement in blood pressure from mind control is 5mmHg at best (and given the size and quality of the studies, that’s being generous) (Anderson et al, 2008; Barnes et al, 2008). So for hypertension, changing your thinking has, at best, only about a quarter as powerful as changing your diet, not four times more powerful as Dr Leaf would have us believe. One more nail in in the coffin for Dr Leaf’s theories. Dyslipidaemia is medical jargon for cholesterol behaving badly. Cholesterol is a waxy substance that’s found as a component of the fats in our diet. To simplify a complex process, we need cholesterol to make our cell membranes, and cholesterol is also an essential building block for most of our hormones. Cholesterol is usually carried around the body on protein transports called lipoproteins. If there’s over-production of these lipoprotein particles or they’re not cleared by the liver properly, then the cholesterol they carry can get up to mischief. The pathways and means of lipid metabolism in the human body reflect complex processes, and genetics, certain medical conditions, medications, and environmental factors can change how the lipoproteins behave. So how much does thinking affect our cholesterol? Well, there isn’t a lot of research looking at the subject, but a few studies have looked at cholesterol (specifically triglycerides, one of the lipids in the cholesterol ‘team’) and ‘mind-body practices’ (such as self-prayer, meditation, yoga, breathing exercises, or any other form of mind-body related relaxation technique or practice). In a cross-sectional analysis of a cohort from the Rotterdam Study, Younge and colleagues examined the association between mind-body practices and the blood levels of triglyceride. They found that mind-body practices were associated with a triglyceride level 0.00034 mmol/L less than those who did not perform mind-body practices (Younge et al, 2015). That’s nearly imperceptible, possibly an artefact. In fact, the average effect of placebos (the fake pills given as a control in therapeutic drug trials) are far greater – 0.1 mmol/L on average (Edwards and Moore, 2003). Dietary interventions such as low carbohydrate diets decreased triglycerides by 0.26 mmol/L compared to low fat diets (Mansoor et al, 2016), and low fat diets up to 0.27 mmol/L lower than standard diets (Hooper, 2012). Statins, the lipid-lowering medications, reduce triglycerides by between 0.2-0.4 mmol/L depending on the specific drug studied (Edwards and Moore, 2003). The point of all this isn’t so much the specific numbers but the obvious difference between the (lack of) power of thought over an important lifestyle condition compared to the effectiveness of diet and medications. If thinking was four times more important to the process of human food related health issues as Dr Leafs proposes, then thought-related ‘mind-body’ interventions should be at least four times more effective than any other intervention. But the numbers don’t reflect that – ’Mind-body’ interventions are 1000 times weaker than dietary or drug interventions. So Dr Leaf’s pronouncement that “the mindset behind the meal – the thinking behind the meal – plays a dominant role in the process of human food related health issues, approximately 80 percent” is complete bunkum. There is no evidence to support the 98 percent myth which forms her statements underlying premise, and the examples of hypertension and dyslipidaemia, two common lifestyle conditions with proven genetic and dietary links, prove that thought based interventions are much, much weaker than dietary or drug interventions. Therefore Dr Leaf’s claim that what you think affects what you eat is entirely baseless. On face value, the statement seems to hold some weight. Food does have an impact on how our brain works. It certainly isn’t the only factor though – demands in the environment, our oxygen levels, our hormones, the function of our major organs, infections or injury, and our levels of sleep, all play a significant role on how our brain functions too. But strictly speaking, what we eat does have an impact on how we think – if we haven’t eaten, or if we don’t consume enough calories, especially carbohydrates, our body slows some of our bodily functions down to preserve energy, including some of our cerebral functions. So when you hear people complain that they can’t think because they have low blood sugar, that may in fact be true. On the other hand, a pure glucose load can shift the balance of the amino acid tryptophan in our body, which enables the brain to produce more of the neurotransmitter serotonin, which can lift our mood. Or ingesting food or drinks with stimulants like caffeine, such as my morning espresso, also improves how we think by making us more alert. Well, that statement may contain an element of truth but only because it’s so hazy and indefinite that it’s applicable in the broadest sense. Technically, we’re always emotional to one degree or another. Even if I assume that Dr Leaf’s is meaning ‘angry’ when she says ‘emotional’ then it’s not so much that our body digests food incorrectly, but just differently. When you’re highly aroused (physiologically, not sexually, just to clarify), your body goes into fight or flight mode. The body diverts blood away from your intestines and towards your muscles, heart and lungs, so that you have the energy to handle the crisis. The food in your stomach and guts isn’t going anywhere, and your body leaves it where it is to come back to it later when the crisis has been averted. This is a normal physiological response. The body still digests the food and absorbs it correctly, things are just delayed a little (Kiecolt-Glaser, 2010). The biggest problem with Dr Leaf’s ‘eating behind the thinking’ argument is that it directly undermines her previous teaching. 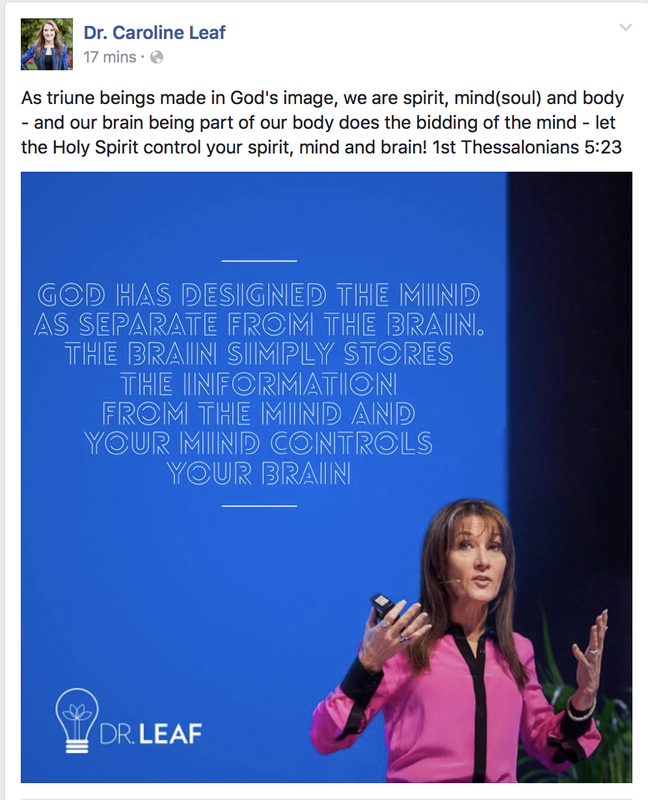 So the obvious question is, “If God designed our mind (our thinking) to be separate from the brain and to control the brain, then how can the food we eat make any difference to what we think? My diet affects my brain through the amount and timing of glucose I ingest, but can my diet can’t affect my thinking if the mind is separate to the brain and controls the brain? Either the mind is separate to the brain, or it’s not. It can’t be both. If the mind is separate to the brain, then what you eat can’t affect what you think and the book becomes an emaciated shadow of rhetoric. If the mind is dependent on the brain then the book and seminar maintain some semblance of validity, but the rest of Dr Leaf’s ministry crumbles like a well-made cheesecake crust, since the entirety of Dr Leaf’s ministry rests on her idea that the mind is separate from the brain and controls the brain, not the other way around (https://cedwardpitt.com/2016/05/30/dr-caroline-leaf-and-the-mind-brain-revisited/). At the very least, this must be embarrassing for Dr Leaf, and if she keeps shooting herself in the foot, people will eventually notice that she’s limping. So other than the free-range, fair-trade, grass fed, organic agro-ecologically produced kale and spinach root muffins and the chia and dandelion broth, it appears that the attendees at Dr Leaf’s workshop today may not be getting what they signed up for. What you think does not radically change your health, or influence what your food does to your body, and the food you eat does not significantly change how you think. Our diet is important to our health, but we can’t think and eat ourselves smart. Edwards JE, Moore RA. Statins in hypercholesterolaemia: a dose-specific meta-analysis of lipid changes in randomised, double blind trials. BMC Family practice. 2003 Dec 1;4(1):1. Hooper L, Abdelhamid A, Moore HJ, Douthwaite W, Skeaff CM, Summerbell CD. Effect of reducing total fat intake on body weight: systematic review and meta-analysis of randomised controlled trials and cohort studies. Bmj. 2012 Dec 6;345:e7666. Kiecolt-Glaser JK. Stress, food, and inflammation: psychoneuroimmunology and nutrition at the cutting edge. Psychosomatic Medicine. 2010 May;72(4):365. Mansoor N, Vinknes KJ, Veierød MB, Retterstøl K. Effects of low-carbohydrate diets v. low-fat diets on body weight and cardiovascular risk factors: a meta-analysis of randomised controlled trials. British Journal of Nutrition. 2016 Feb 14;115(03):466-79. Younge JO, Leening MJ, Tiemeier H, Franco OH, Kiefte-de Jong J, Hofman A, Roos-Hesselink JW, Hunink MM. Association between mind-body practice and cardiometabolic risk factors: The Rotterdam Study. Psychosomatic medicine. 2015 Sep 1;77(7):775-83. They say that if you want something badly enough, you can make it happen … you just have to believe in it to make it work. Wish upon a star, believe in yourself, speak positively, think things into being … it’s the sort of magical thinking that forms the backbone of Hollywood scripts and self-help books everywhere. But that’s not how science works. In the real world, believing in something doesn’t make it magically happen. Holding onto a belief and trying to make it work leads to bias and error. Instead of finding the truth, you end up fooling yourself into believing a lie. This is the trap that Dr Leaf has fallen into as she continually tries to perpetuate the unscientific notion that the mind changes the brain. Dr Caroline Leaf is a communication pathologist and a self-titled cognitive neuroscientist. Her philosophical assumptions start with the concept that the mind is separate from and controls the physical brain, and continue to unravel from there. The problem is that Dr Leaf can’t (or won’t) take a hint. I’ve discussed the mind-brain link in other blogs in recent times (here and here), but yet Dr Leaf continues to insist that the mind can change the brain. It’s as if she believes that if she says it for long enough it might actually come true. 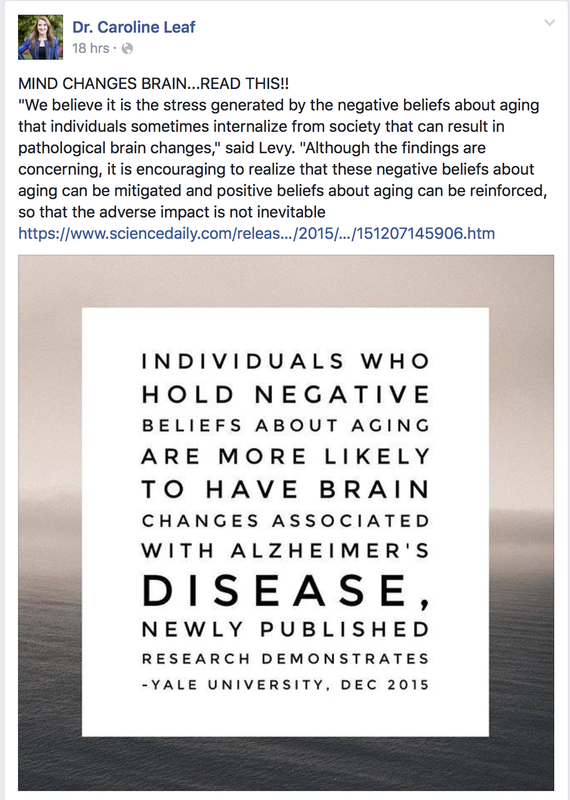 Today, Dr Leaf claimed that “newly published” research from Yale claimed that, “Individuals who hold negative beliefs about aging are more likely to have brain changes associated with Alzheimer’s disease.” Except that this research is not really new since it was published last year, and Dr Leaf tried to draw the same tenuous conclusions then as she’s doing now. “We believe it is the stress generated by the negative beliefs about aging that individuals sometimes internalize from society that can result in pathological brain changes,” said Levy. “Although the findings are concerning, it is encouraging to realize that these negative beliefs about aging can be mitigated and positive beliefs about aging can be reinforced, so that the adverse impact is not inevitable”. Well, the issue is clearly settled then, all over bar the shouting. Except that the promotional article doesn’t go through all of the flaws in the methodology of the study or the alternative explanations to their findings. Like that the study by Levy, “A Culture-Brain Link: Negative Age Stereotypes Predict Alzheimer’s Disease Biomarkers” , only showed a weak correlation between a single historical sample of attitude towards aging and some changes in the brain that are known to be markers for Alzheimer Dementia some three decades later. They certainly didn’t show that stress, or a person’s attitude to aging, in anyway causes Alzheimer Dementia. And they didn’t correct for genetics in this study which is the major contributor to the risk of developing Alzheimer’s . So no matter what Dr Leaf or the Yale PR department thinks, the results of the study mean very little. But why let the lack of ACTUAL EVIDENCE get in the way of a good story. It’s sad to see someone of the standing of Dr Leaf’s shamelessly demoralise themselves, scrambling to defend the indefensible, hoping beyond hope that what they believe will become the truth if they try hard enough. It doesn’t matter how much Dr Leaf wants to believe that the mind changes the brain, that’s not what science says, and clutching at straws citing weak single studies and tangential press releases isn’t going to alter that.